I bet John’s going to blame me for this. I didn’t think they’d take it as a challenge. But part way through Benedict Cumberbatch did a riff on fan fiction — slash aka Johnlock in particular — which included what I’m certain he thought was an impossible scenario. Benedict Cumberbatch underestimates the ability of fan writers to meet his challenge. Unbeknownst to Mr. Cumberbatch, I love a challenge… so below is a bit of flash fanfic (and please note, Mr. Cumberbatch, it is not slash aka Johnlock. We aren’t all prurient, but we are creative). His instincts were screaming “Danger! 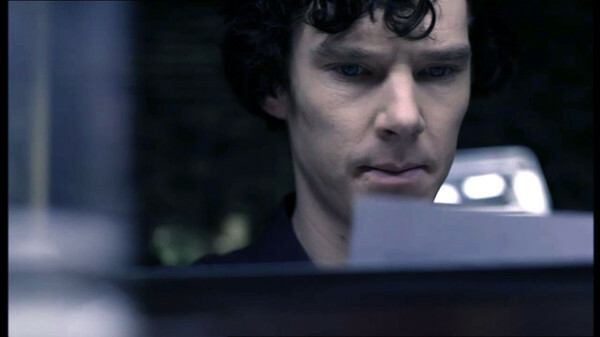 Danger, John Watson!” and he turned towards a movement in the shadows just before nothing. John Watson was relieved by a slightly muffled reply of “Don’t shout.” He tried to move, but he struck something within a fraction of inch. “Ow! John, don’t move,” Sherlock ordered. John stifled a shriek as he felt something slip down his stomach and nestle in the hollow between his thighs. He felt unusually light-headed and queasy and would swear he was floating about an inch from the side of the wall — or floor — or ceiling. “Sherlock. Where. Are. We.” John gulped and pinched his lips together to choke back the upheaval in his stomach. “This is ridiculous. I’m going to help the others,” Sherlock replied. The clasp of the cuff around his wrist popped open. He removed his wrist. The cuff bobbled, floating in the air. Sherlock did a slow turn and reached for a handhold as he floated up. “Star Trek?” Seeing a combination of scowl, sneer, and disdain blend on Sherlock’s highly expressive face, John added, “You can even mock the science and Spock’s logic while we watch.” It’s not like he isn’t going to do it anyway, John thought. John Watson shook his head. It was going to be a very long week. This entry was posted in Captions, FanFic, News and tagged bbc sherlock, benedict cumberbatch, FanFic, Fiction, john watson, TopGear on July 16, 2013 by JH Watson. I haven’t giggled so much in a long time. You made my day. I thought that I was the only one alive to admit being a fan of “Dr. Smith, Will Robinson and the Robot” I’ll never tell anyone. I promise. I also will envy space rats now, thanks.